Called ‘The Aloha State’, Hawaii’s six islands welcome you with a smile; ‘Aloha’ is both a greeting and a lifestyle. Each island has its own distinctive character – Oahu is lively and Maui is captivating; Kauai is perfect for rejuvenating and Hawaii island is for the adventurer. Come to the Hawaiian islands to enjoy the luau and lei traditions that have made it famous, and settle into the easygoing sway of island life. North of Hawaii Island is Maui, ‘The Valley Isle’. It’s where you’ll find the incredible Hana Highway route, and award-winning beaches like Wailea which is perfect for romantic strolls. Keen golfers are spoilt for choice, with three championship-level golf courses. Further north-west is energetic Oahu, called ‘The Heart of Hawaii’. Come here for lively Waikiki Beach, and all the urban charms of state capital Honolulu on the southern shore. North of Oahu is verdant Kauai, ‘The Garden Island’. The oldest of all the islands, it boasts 90 miles of sandy beach, and plenty of miles of wilderness for trekking. 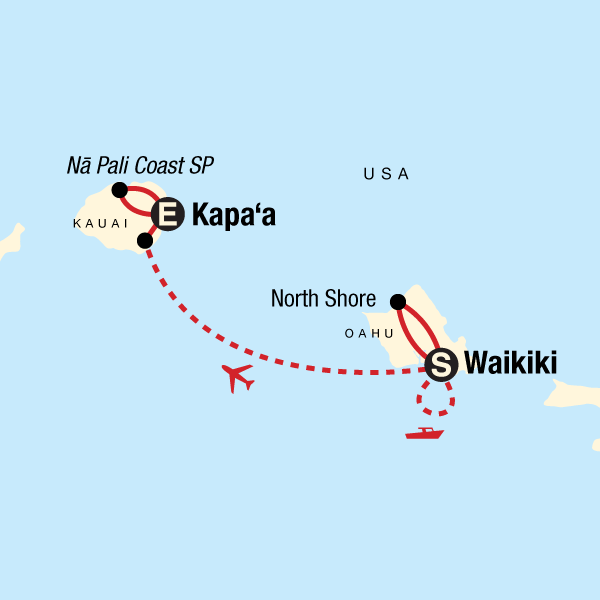 The lush green Kauai is fantastic for intrepid explorers and nature lovers. Take in the stunning Wailua Falls in Lihue, or enjoy the fun of Poipu on the south shore. The golden sands of the Coconut Coast are perfect for chilled-out afternoons of sunbathing, drink in hand. The island of Oahu is home to sun-drenched Honolulu – come to this dynamic yet laid-back city to get your dose of bright urban lights. Waikiki’s hotels are perfectly located for shopping and the beach; get yourself a wetsuit and head to Waikiki Beach for surfing lessons. Golfers and shoppers alike will love Wailea – it’s got three amazing golf courses and the shops have all the big brands you could ask for. For fantastic views, make your way to upcountry Maui. Drive to Haleakala National Park to take in the sunrise or stroll through the historic town of Lahaina for dining, arts, and shopping. Hawaii Island, or Hawaii, The Big Island, is the largest of all the Hawaiian islands. See waterfalls and rainforests in Hilo, swim with the mantra ray in Kona or view one of the world’s most active volcanoes – Kilauea. What is the currency in Hawaii? 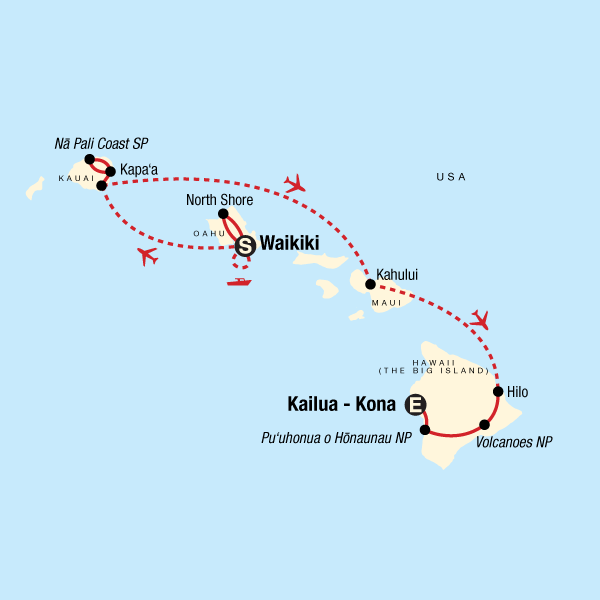 The flight time to Hawaii is at least 16.5 hours: 11 hours to Los Angeles, plus 5.5 hours connecting flight to Hawaii. What is the time difference in Hawaii? Hawaii is 11 hours behind GMT/UK time. When is it best to visit Hawaii? Hawaii treats its guests to a warm, tropical climate with year-round sunshine. Temperatures average at a balmy 28 (°C) in the winter (December-March), climbing up to 31 (°C) during the summer season (April-November).